How to get inspired to make your very own Jane Austen Christmas tree and have lots of fun with it using your creativity and almost no money! I’ve always wanted to have a Jane Austen Christmas tree since I started my page on Facebook in 2012 (www.facebook.com/allthingsjaneausten). About two years ago I went to England and visited the Jane’s House Museum and the Jane Austen Center in Bath and brought a few cute items home. I also had collected trinkets and some very special gifts some of my very special friends had sent me. After one week immersed in Jane Austen’s World I returned home determined to build one. On this post you will get some ideas how to make your own. You must try it. Even if it is a second tree that you put in your office/studio/library/favorite place. The felt ornaments (Elizabeth Bennet and Miss Jane Austen) were bought in Bath at the Jane Austen Centre shop on Gay St. but you can make your own or find similar items on Etsy. All you have to do is a little research! Go to etsy.com and search for “Jane Austen christmas and/or ornaments” and you should see a bunch of ideas pop up in front of you. I printed a picture of Pemberley, a picture of my favorite couple, a picture of Emma (dvd cover), a portrait of Jane herself and some other favorites. That alone can be most of the tree. This ornament (below) was a very special gift and they are also from Bath. I’m not even sure you can still order them. But you can always buy white Christmas bubbles and and decorate with a sharpie pen! You can write your favorite quotes or her silhouette. Oh so many ideas… and you will have it done in no time. Another option is Christmas cookies ornaments. That will be my next project. Jane Austen Cookie Christmas Tree! But I digress. That is for next year. Now take a look at how to make cookie ornaments on the video below. There are many tutorials on YouTube how to decorate cookies but Sweet Ambs is the best! You can follow her on YouTube, on Facebook and @sweetambs on Instagram. She makes everything looks easy so it is obvious we need a lot of practice but I am determined! I want and I shall make a Jane Austen Christmas tree with Jane Austen themed cookies and crochet doilies. Just wait! You can also get some cameos and string some pearls around for a totally different look. You can find them on ebay or etsy or maybe even in your attic! I hope you liked this post and got inspired to make your own Jane Austen Christmas tree! Good luck and please share pictures if you decide to make one. 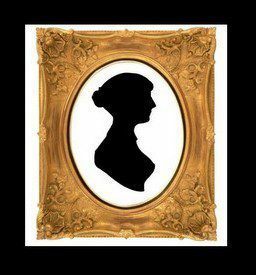 You can share them via private message on the All Things Jane Austen page on Facebook. That would be great! Very cute!! I have a woodland creatures tree in my room! I may have to do a small JA tree fir my kitchen!!! Thanks for the inspiration! Love your tree and all the ornaments!!!! What fabulous ideas and thank you for sharing them. I do like the photo frame ones…I might check out my local dollar store and give one or two or three…a try! As for the cookies, they are gorgeous and it would take many, many tries, if ever, before mine would look that fantastic. They are a work of art themselves! I totally agree, Carole! I am so happy you like the post! Thanks for following! até eu, que não morro de amores por árvores de Natal, fiquei com vontade de montar uma cheia de cookies! Thank you so much! I’m so glad you like it. Happy New Year! What a beautiful tree and I love the look of those cookies! !